In my quest to make sure I post something everyday, I’ve decide that Sunday will be book review day. I like to try and keep my weekends free for the girls since they see me sit at the computer all day during the week. Book reviews are something I can do ahead of time and schedule to post. Seems like an excellent and elegant solution and what better way to do it than kick off on Sept 8 International Literacy Day. I’ve been an avid reader all my life so I have a mountain of books that I love but I’m going to try and select books that seem to have some kind of current tie to my life or else the selection process would seem overwelming. Part of what I love about the whole e-book/Kindle thing is that I can look back and know exactly when I read or purchased a book. I bought this book on April 21, 2011 at what looks to be the full retail price (You’re welcome Rainbow). I seem to remember that I read a book review in a magazine or newspaper at the time and decided to buy it based on that. I remember what caught my interest was the premise – the fellow falls for the girl because his IT based job is to read her emails, and that the setting was a bunch of 20 somethings in an IT department during the whole Y2K thing. Since I was a 20 something in an IT department during the whole Y2K thing I felt immediately pulled the story. I realize looking back that right there based on that point I was either going to love or hate this book based on the author’s ability to get that part right. Clearly she got it right. In fact Rainbow’s ability (like how I feel on a first name basis with her?) to get time and place right seems to be her talent as an author. For me to really really love a book it has to be different than something I’ve ever read before. My literary pet peeve is to watch the same old plot hashed out over and over again – especially by the same author but that is another story Ms Anne Rivers Siddons. 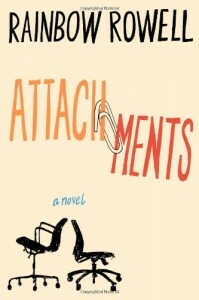 Attachments to me was unusual because what appears on the surface to be a chick-lit book gives the lead to the male character, Lincoln. Lincoln job is to monitor red flags caught by the mail filters in a mid-west newspaper publisher’s IT department. Two girls who are friends at the newspaper use email to chat more than they should (who didn’t in 1999 – we didn’t have texting back then – I know life time ago right?) and as a result Jim gets to know them pretty well by vetting their emails and starts to fall for one of the girls, Beth. From there the story could go a lot of really cliché places but it doesn’t. Rainbow manages to tell a romantic story without falling into any of the traps you fear. She neatly navigates the story in way that makes you fall in love with Lincoln and Beth and makes you kind of depressed that you don’t know them in real life. Lincoln falls for Beth through his voyeuristic view of her via her emails to Jennifer (and somehow it never gets creepy feeling)and Beth notices and develops an office crush on The Cute Guy she notices and starts to mildly stalk at work. Lincoln is just “that guy” we all hoped to find and mostly overlooked right next to us when we were idiot 25 year olds. If you’ve ever been a fan of Jim and Pam over at The Office- you’ll love Lincoln and Beth. Since reading this book I’ve also read Rowell’s 2nd book Eleanor and Park – which is again proves that she has a talent for time and place. At first I was mildly disappointed when I heard that her second book was a Young Adult (YA) – it seemed like what I thought was going to turn out to be a new favorite author was just going where the money was. I get that YA is where it’ at – it’s the “Cool Kids Table” of publishing these days. But after reading E&P I was impressed that if she was going to go there, at least she did it her way. She hits her sweet spot by setting the novel in the mid 80’s so she can once again get all the nuances of time and place, as well as the pop culture references, right. She must have kept some awesome journals as a teenager. After two books I’m starting to feel about Rainbow Rowell books like I feel about John Hughes movies. Each one is different (thank god she isn’t falling for or getting pulled into the trilogy trap) and the one word that comes to mind when I think of her work is Authentic. It just feels real. Real people, real settings, real emotions and no one is perfect but there is always hope that things will work out for the best. For that reason I’m really excited for her 3rd book which comes out this week: Fangirl. But at the same time I’m feeling a little trepidation – it’s YA again, coming of age and seemingly set in modern day, which takes her out of her own experiences, out of her sweet spot. I had hoped that she’s go back to writing something more grown up. That she would not get caught up in the YA label and market. Yes, the “Fan Girl” experience can be a bit timeless but, for an author that was won me over over with her authenticity… I feel like she is sailing into rocky water. And also, my tolerance for the YA/coming of age stuff is going to run fairly short when I know she can do so much more. We shall see….if I remain a “Rainbow” fangirl myself after this.